A browse event trigger initiates an automated message that targets a customer who has visited your website, browsed items and then abandoned the website without adding anything to the cart. This message can be delivered automatically to promote items previously viewed and may include images/descriptions of the products and links back to product pages. Browse abandon messages are a great way to re-engage prospective customers by showing items recently browsed and offering an incentive to return to the site and continue shopping. In order for the browse abandon message to send, there needs to be data sent to the system that will trigger the automation. In the case of a browse abandon message, we will use the trigger of when a contact browses an item on your website. If an item is ordered or added to the cart, then we will cancel the message based on a cart or order event. This strategy utilizes 3 primary pieces of data. Purpose: This named event is used to trigger the message sending process. Optional properties (category, product, description, etc.) can be passed along with the event to personalize message content and create audience rules for searching and segmentation. Data type: Event data stored in the contactactivities collection. Note: The actual name of the event is up to the client, but we typically recommend "browse". Purpose: This named event is used to cancel the actual message sending process if an item is added to the cart during the time frame between the browse event and the message send (per the custom delay). Note: The actual name of the event is up to the client, but we typically recommend "cart". Purpose: This event will be used to cancel the actual message sending process if a purchase occurs during the time frame between the browse event and the message send (per the custom delay). Note: The actual name of the event is up to the client, but we typically recommend "order". Prerequisite - assumes the user's browser has a cookie which holds the contact ID. There are 2 ways this cookie may be set. A cookie will be set when a contact arrives on the site via a tracked link clicked from an email. In this case, a first party cookie is automatically written with the contact ID. Learn more about the identify and contact methods. The properties object passes key/value pairs describing the browse event that can be used for creating an audience, searching contacts and personalizing message content. 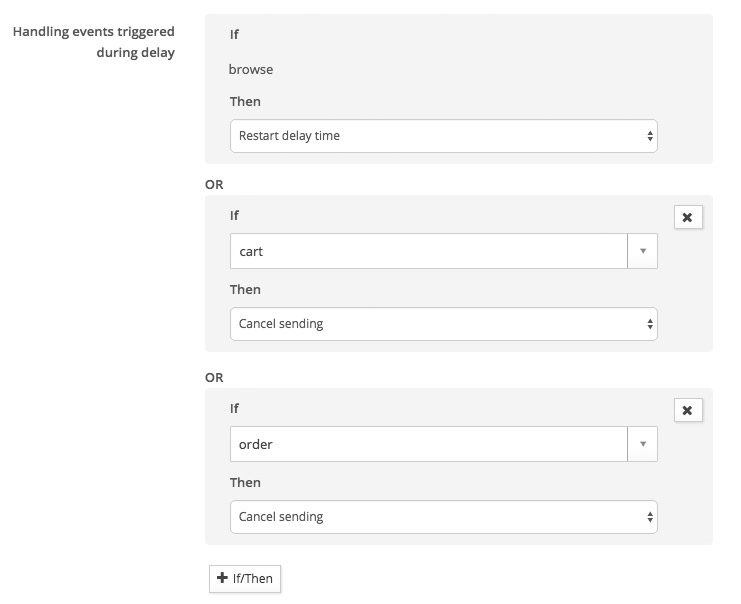 The cart event is used to cancel the message if an item is added to the cart during the time frame between the browse event and the message send (per the custom delay). You also have the option of adding the details of cart items to the cart object (stored as contact attribute data) for the purpose of an abandon cart message. Read more about setting up an abandon cart message. Note: the cordial.order('action',orderObject); call is optional, and not required for browse abandonment. However it is highly recommended that order data is passed using either this method or the REST API when an order is placed in order to take advantage of segmentation by purchase behavior. Assumes the contact has been identified as part of the session. Now that we have the appropriate data points (passed by either the js listener or the REST API) we can set up the event triggered automation template. In the navigation menu choose "Message Automation" and click "Create New Automation". In the left panel under "Sending Method", click "Event Triggered". For "Trigger event", choose "Custom Event" and then choose "browse". Note: The "browse" option will appear in this menu as soon as the first browse event has been passed to the account. For "Delivery Time" choose "Delay Sending". Set the delay to 2 hours (or whatever interval makes sense for your shopping experience). For "Handling events triggered during delay", there are a series of conditions that can be set. For the first condition: "If browse then" select "restart the delay time". This ensures the full 2 hour delay is respected if other browse events occur after the initial event. 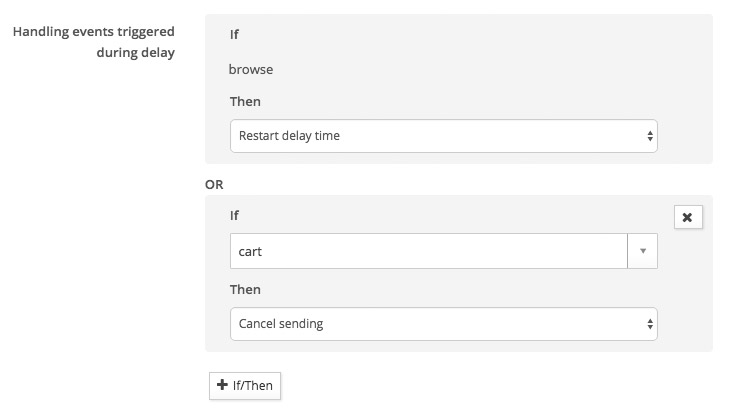 Add a second condition: If "cart" then "cancel sending". This ensures that the browse abandonment email is not sent if the customer adds an item to the cart before the delay time ends. Note: The "cart" option will appear in this menu as soon as the first cart event has been passed to the account. Add a third condition: If "order" then "cancel sending". This ensures that the browse abandonment email is not sent if the customer actually places an order before the delay time ends. Note: The "order" option will appear in this menu as soon as the first order event has been passed to the account. For "How often can this message be sent to an individual" select "Custom Interval" and set as 1 time per 7 days. The frequency limit can be set to whatever interval makes the most sense for the shopping experience you would like to create. We recommend limiting these triggers to once a week. Once this is saved and the message content is published you can "Enable" the sending method of the message. As soon as a message is enabled, the triggers are active and the message will send according to the rules applied. The following is an example of the Smarty code used to display the browsed items in the body of a message. Using the tabs, you can view the HTML and Smarty, the example event data used and the rendered output that will show when a message is sent or previewed. Learn more about Smarty and the getEventRecords method. Our example code will pull all browse events from the database and render them in the message for each contact, but you'll most likely want to filter the results and show only the most recent browse events. The getEventRecords method has several parameters you can apply to filter the query results. Learn more about the getEventsRecords parameters. The example above will limit the results to "5" events and sort them in a descending order. Note: "ats" stands for Action Timestamp and is the parameter used for sorting or rendering the event time stamp. In our example, we are only allowing a message to be sent once every 7 days, so it makes sense to show only events that happened during that time period. We can add the "newerThan" parameter with Smarty that generates a date that is 7 days earlier than the current server timestamp. Learn more about data and timestamp variables. The example above will query 5 browse events from the past 7 days and only display the items with a unique productID.